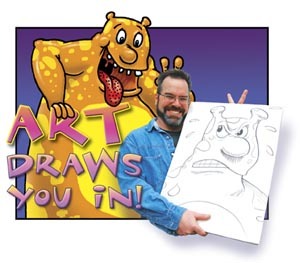 Examine the mystery and fun of cartooning. Simple scribble or an abstract shape is turned into a recognizable character (fish, dog, person, etc.) or scene. Older students can explore the facets of cartoon concepting, working together to create humorous panels involving historical subject matter. Basic story elements are discussed as well as techniques to convey emotions through facial drawings. Finally, students draw a character utilizing basic geometric shapes.